Come hang out with us in our Ideas Lounge! We’ve added events to our calendar that will be available for the MRU Community to enjoy throughout the summer. You’ll definitely be impressed as you show off your gaming skills on the 18-55″ LCD monitors that make up the Visualization Wall in the Lounge or try out the VR/AR/MR technology we have available. Highlights are below, but please be sure to check the Library calendar for the full schedule and any changes. Programming starts Tuesday, July 3. Spend your break with us. Sit back with fellow movie buffs and enjoy a film on our impressive Visualization Wall. We don’t have popcorn but feel free to bring your lunch. Learn something new while witnessing remarkable storytelling through a TED Talk. Connect with fellow gamers and try out popular games that are all abuzz. This is your chance to experience the difference between Virtual Reality, Augmented Reality, and Mixed Reality. 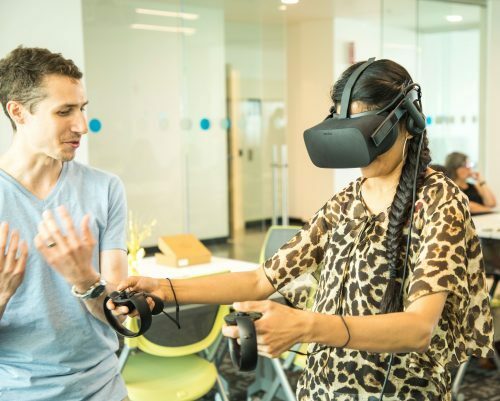 An afternoon of fun is inevitable once you get settled in a headset and step into a new world, but this is also an opportunity to ask questions and see how this technology can incorporate into your class or research project. Can we interest you in a game of Mario Kart? Drop in over your lunch break and enjoy video game favourites! Please contact Anna Nuhn with questions about programming or drop in details.